Yes, these are all new "breeds" of grapes. In an effort to make fruit more relevant to consumers' now intensely sugary palates, horticulturists and fruit breeders are cross-breeding grape varietals- taking the sweetness of one, the texture of another and forming grapes that will hopefully be as addictive as candy. 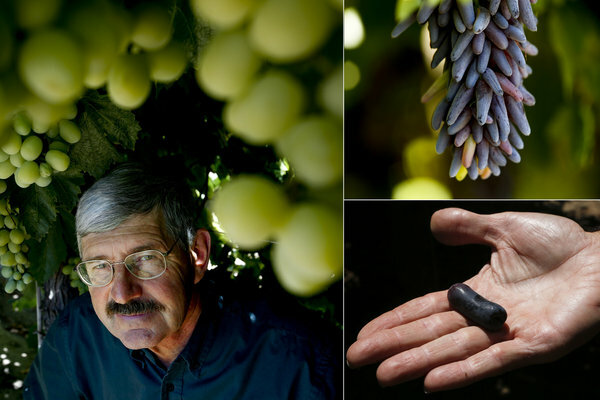 "We're competing against candy bars and cookies," said Cain, 62, a former scientist at the U.S. Department of Agriculture who now heads research at privately owned International Fruit Genetics in Bakersfield. "Columbine Vineyards in Delano, Calif., already has two successful patented varieties, the cranberry red Holiday Seedless and the ultra sweet Black Globe, a seeded berry with a strong following in Asia. More are in the pipeline."